wowhead lists it as being contained in the greater cache of treasure as a reward from a quest. However, if you look THAT item up, it has the drop but it refers you to a similar item with the same name. If you investigate the drops in THAT cache, it contains neither the vial NOR the bear and the lady fair. Well im now dedicating this post to finding the "true" drop for the ooze. Its a ninja turtle reference, there is a rat with 4 turtles in Dalaran that is a sure reference, but after visiting and spamming emotes did not figure anything out. The most likely source would be a place with alot of oozes, perhaps even one of the "mad scientists" in wow. Putricide comes to mind, but no reports have come from him yet and none of the other bosses have come from raid content. Edit: Also I've made a bug report on the bug forums. It may be safe to assume that blizzard themselves is not aware that the caches are two different items, and even if the ooze has a different drop its intended to come from the scenario bag. Please update with griping! I hopes this helps as I have done 30 some today for it, and the other that is listed as dropping from a scenario, and 24 yesterday. Happy Hunting! Considering my experience with The Bear and the Lady Fair looks like it may drop from RANDOM scenario queue if that scenario happens to be "Blood in the Snow" or "Dark Heart of Pandaria". Not sure if someone in a group has to be on the quest. I can 100% confirm that this drops from the "First Scenario of the Day" cache. http://i.imgur.com/ZfrcaYh.jpg This was my first one, done about 5m prior to typing this. I have ~30-40 "Nth Scenarios of the Day", so I'd almost like to confirm that it DOESN'T drop from grinding Scenarios, only the first one matters. I ran ALOT RANDOM normal scenario. Lucky got them today. TOOK ME GOOD 100-125 runs. It's RNG MON! http://imageshack.us/a/img90/1615/scoredtwo.png larger picture to see clearly my loot. Just wanted to say you can get multiple of these items happened to me a few hours ago. I have yet to hear of someone getting it other than in the scenario box..... however has anyone tryed going into dalaran sewers to the TNMT easter egg part and do any emotes? Got mine today inside Greater Cache of Treasures from my third random scenario of the day. Got mine on my first "normal" scenario post 5.3. I thought it would bring rep but looks like its a one-time quest. Got it after I queued for 2 random normal Scenario run from a Greater Cache of Treasures. It seems these Brawler drops are pure RNG. I've gotten the Bear and Lady Fair 6 times now and still no Vial. Getting one does not increase your chance of getting the other at all. Guess I could buy it with all the money I've gotten by running scenarios over and over hunting for this item. Oh right, it's BoP. Okay, maybe I could send it from my boomkin, since I don't brawl with that toon. Aaaaah, right. It's not BoA. Over 100 normal scenario runs now, has just not dropped for me yet, feeling so unlucky... hope you guys get more lucky! Got this item from the Greater Cache of Treasures that was a reward for the quest Blood in the Snow from Lorewalker Cho. It was a twist of fate since it was my very first Scenario for the character I was playing and I haven't played for a year straight. I don't consider myself lucky about it because Brawler's Guild does not really of interest to me. Is there any way how to stop dropping this crap q item? It drops for all of my characters every day from random scenarios rewards. I will never do that crap in Org, so I have to throw them away every day. I've done around 100 scenarios over the last 2 weeks trying to get the vial. 2 "Bear & the Lady Fair" have dropped but still no vial. Very frustrating. Okay ! I am just celebrating my 100th random scenario without looting this ! So, beacause other comments are quite old, I wonder if anyone can confirm that it still can be found in the Greater cache of treasure, and I mean anyone who found it recently ! It is the last item I need to complete the achievement, and here I am just starting to be a little crazy on this ! I can confirm that this still drops from the Greater Cache of Treasures. I got mine after two scenarios, but keep in mind. That was two scenarios after I got told that they drop from it. I have done MANY scenarios, even HC scenarios without ever seeing this. So I'd say around ~100 scenarios in total throughout MoP. This dropped within a few kills of the small Crude Slimes at the back of the cave under Highpass in Gorgrond (entrance: 54, 56). doing Garrison Campaign: Crows in the Field. Dropped from one of the slimes at the bottom of the caldera you are flown to by the druids - not sure if it was the boss slime or one of the collateral damage smaller ones! Also drops off King Slime. Mine dropped during a Garrison Campaign quest. Since there are a lot of comments about it dropping from here and there I just wanted to confirm this still drops in Legion (7.1.5), but the associated quest (Splat) is not available any more. I'm still waiting for a GM to confirm this suspicion, but it pretty much looks like it's gone for good. This means that both shirt giving quest items from Draenor Brawler's Guild are not useful anymore and can be thrown away. Bummer it still drops to show that you missed some thing. 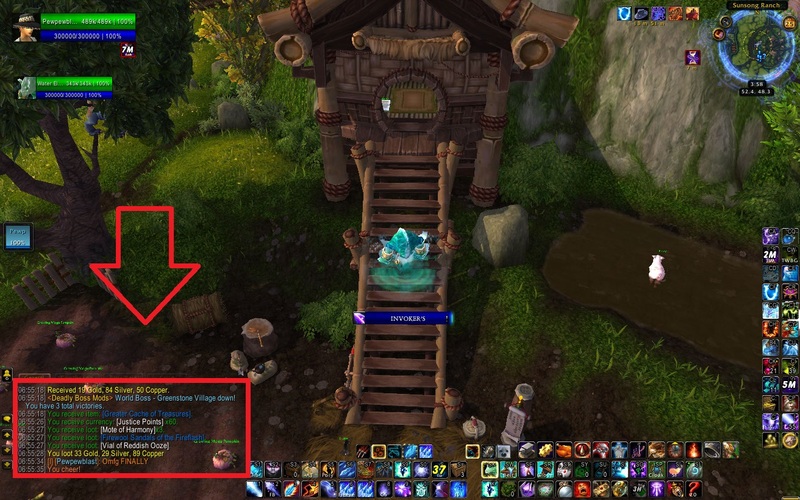 Edit: 2 days later, a GM confirmed that the item is linked to a quest not available any more. You can throw this item away. "The contents swirl and tremble, violently testing the strength of the vial's stopper."